Yoko Ono celebrates "The Art of John Lennon"
UPPER WEST SIDE — Yoko Ono is one of New York's legendary fixtures. The artist and activist has lived in the Upper West Side’s Dakota for the last 40 years, across the street from Strawberry Fields — a part of Central Park dedicated to the memory of her late husband John Lennon, who was assassinated at the doors of her famed apartment building. While Ono continues to make music and fight for causes like combating urban hunger and opposing fracking, one of her greatest legacies is her work to keep the memory of the former Beatle alive in New York City. Timed to what would’ve been Lennon’s 73rd birthday on Oct. 9, Ono is opening an exhibit of 100 of the late singer’s drawings and songs that were created between 1964 and 1980. While the exhibit is free, a $3 donation at the door is suggested to benefit Citymeals-on-Wheels, a nonprofit organization that prepares food for the homebound elderly throughout the city. 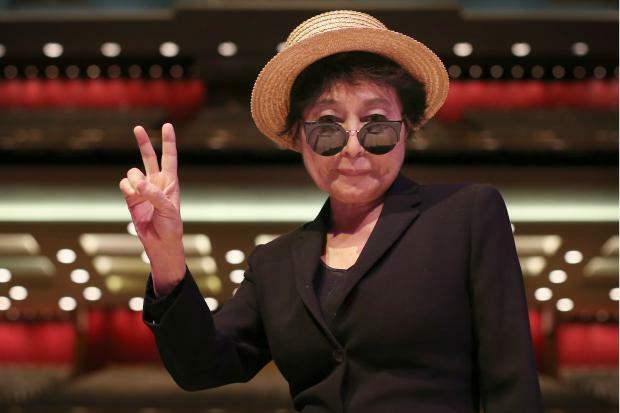 With the release of a new album with her band Plastic Ono Band, “Take Me To The Land of Hell,” and the exhibit at 72 Greene Street in SoHo (which closes on Oct. 14), the 80-year-old Ono spoke to DNAinfo New York about her life in the city, strategic times for entering Central Park and why she's in fear of being overexposed. Where in the city do you see evidence of John Lennon’s impact as a New Yorker? Everywhere. Everywhere — because he was not just sitting in the Upper West Side. He loved SoHo and he loved the Lower East Side, all that bit, you know. We just kept walking. What are some of your favorite music venues in the city? The Bowery Ballroom I did very recently and then I did David Letterman’s show. I haven’t been doing so much in New York City and that’s why, when they said I’m going to do Bowery Ballroom, I said, "I better be good!" I got great, great reviews in Europe so if I did a half-good job in New York City, they’d say "what was that about? She’s not good." I really tried to do my best here and I think I did. Having lived in the Dakota for the last 40 years, how do you feel that the Upper West Side has changed? It didn’t really change so much, you know. The Dakota was always like this. I think it’s a very interesting thing that they call the Dakota the Dakota and the reason is because, I think, when you’re in there, you’re in Dakota. When you’re out, you’re in New York City. Do you spend a lot of time in the neighborhood outside your home? Yes I do. I go through the park and go to the East Side or something to go to a restaurant or whatever. I have to choose the time though. You don’t want to go when people are squashing and "uh, excuse me, let me pass," you know? It’s not awful. I think about it this way: If this is my fate, it’s not bad. You’ve also been involved in the anti-fracking movement. What are you doing with that now? I’m still doing something behind the scenes but I’m taking a rest from going out and speaking about it. The reason is because I think I’m overexposed. Some people must think, "Oh not Yoko again, please!" Are there any particular parts of town where you like to go? No. I’m all routine. I like my apartment. I love the fact that I can just sit in my studio overlooking Central Park and write. What’s your idea of the perfect day in New York City? Well, is there any perfect day in your life? I think I’m just normal in that sense. I take what I’m getting given and feel that it’s a blessing. I’m always thankful about my life.